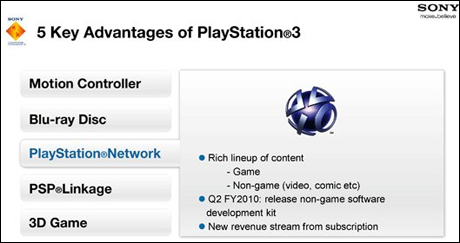 Sony: Paid PSN Subscriptions In 2010 | The Gamesmen- What role will YOU play? One the biggest selling points of the PlayStation 3 is that gamers can use the console to play online at no additional charge. However, evidence has surfaced that the company is planning a two-tiered subscription model for the PlayStation Network similar to–but also fundamentally different from–Xbox Live. Perhaps to assuage PS3 owners’ fears that they would soon have to pay to play online, Hirai issued a subsequent statement indicating the present level of service would remain gratis.